Harding Baseball completed their home series victory over the Southwestern Oklahoma Bulldogs this weekend behind an eight-run performance from the Bisons’ offense. As was the case for the entire weekend, Harding got off to a slow start. Junior Ty Hocker started the game on the mound. In the top of the first inning, the Bulldogs scored one run on a passed ball, but the Bisons quickly answered in the bottom of the inning. Junior infielder Connor Kelly opened the scoring for the Bisons with an RBI double that scored junior infielder Luke Van Dover. The game was tied 1-1 headed to the top of the second inning. The Bisons fell behind once again in the third and were forced to turn the ball over to junior reliever Zack Bilek. In the bottom of the inning, sophomore infielder David Butterfield struck out on a low strike, and Head Coach Patrick McGaha stepped out of the dugout to argue the call. He was given a warning by the umpire. “I just wanted to make sure if he was going to call it one way he was going to call it for both teams,” McGaha said. Once again, Harding responded quickly, pulling ahead in the fourth inning. Freshman outfielder Cody Smith reached base on a one-out single before being batted in by senior outfielder Nolan Fertig, who later scored on an RBI single by junior infielder Miles Humphreys, putting the Bisons in the lead at the top of the fifth. From that point on, the Bisons kept the lead. Bilek allowed no runs in 1.2 innings of work. In the sixth inning, junior reliever Ryder Yakel entered the game and threw the Bisons to the end. Yakel said after last weekend they needed a big series win. Harding took control when Van Dover hit his third homer of the season in the seventh inning. The Bisons scored four runs in the seventh inning and held the score at 8-3 through the ninth. Smith said if they had lost this game, other teams would have had to lose for Harding to move up in the Great American Conference standings. But because of the win, “we control our own destiny,” Smith said. The Bisons are fourth place in the GAC. Harding plays again Tuesday, April 9 in a non-conference doubleheader with Williams Baptist College (WBC). 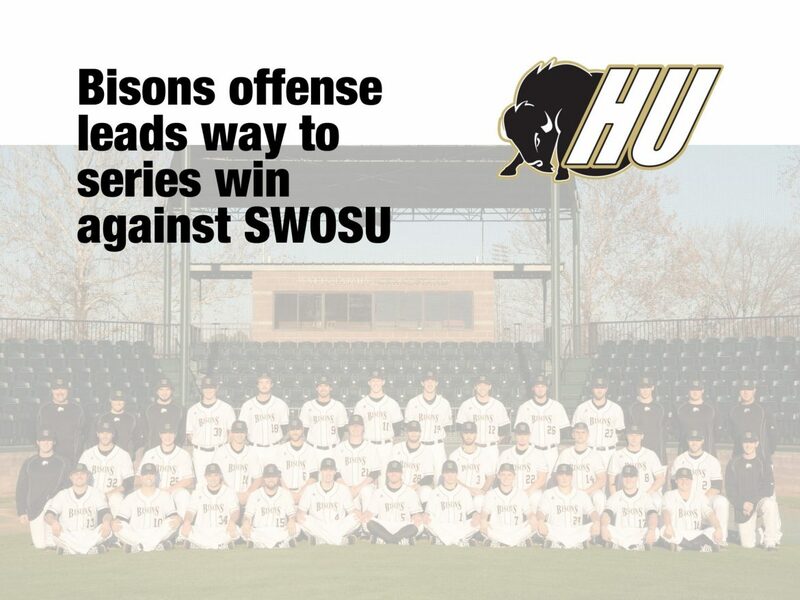 The Bisons swept a doubleheader with WBC earlier this season. First pitch for those games will be at 4 p.m and 6 p.m.